This was published as a Wall Street Journal Think Tank column on January 26, 2016. Former Secretary of State Hillary Clinton and Sen. Bernie Sanders continue to spar over health care and Mr. Sanders’s single-payer plan. Have you noticed that Republican presidential candidates have spent far less time debating differences between their proposals? One reason: Republicans care less about detailed policy plans than do Democrats. 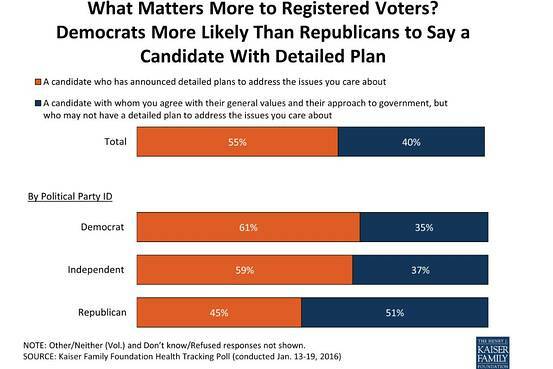 As the chart above shows, 61% of registered Democrats say candidates’ detailed policy plans–on health care or other topics–matter to their vote, and 35% say a candidate’s general values and approach to government matters more. For Republicans it’s the reverse: 51% care most about a candidate’s general values and approach to government, and 45% prioritize their policy plans. It could be that Republicans are more ideological and values-oriented and less focused on policy plans. Another, and simpler, explanation is that Republicans want government to do less than Democrats want government to do so they care somewhat less about plans for government action. Republican presidential candidates are also competing to appeal to elements of a conservative base most likely to vote; detailed policy plans are unlikely to be the best way to gain support in the primaries. Even if detailed plans matter less to Republican voters, sometimes a controversial policy idea from a Republican candidate can grab attention and become the focus of debate, as has happened with Donald Trump‘s suggestions to build a wall between the U.S. and Mexico and to temporarily ban Muslims from entering the U.S. When both parties have nominees and the campaign moves into the general election, the candidates will face greater pressure to produce policy plans on major issues, such as immigration, global warming, and health care, and how to address terrorism and Islamic State. There will be a greater appetite among the electorate for such proposals. Overall, 55% of registered voters say that it matters more to them if a candidate has a detailed plan to address issues they care about than a candidate’s general values and approach to government, vs. 40% saying they care more about general candidate characteristics than policy plans. Independents align more with Democrats than Republicans when it comes to their affection for policy plans. Journalists sometimes struggle with the lack of detail in plans issued by campaigns. For the media, there is a balancing act in taking candidate plans seriously while knowing that proposals can be derailed or substantially changed when they get to Congress. Having watched many debates over health care in election campaigns, I have come to suspect that when fights erupt over the details of policy plans, it’s not the particulars of a plan that matter so much to voters but what voters perceive those plans and details as signaling about the candidates themselves.